Orange and Black Moustache Badge. 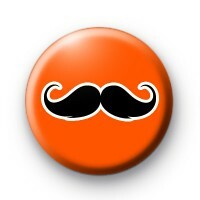 A bright orange button badge with a really cool moustache illustration design. The perfect badge for any moustache waxers & cultivators and perfect for hipsters. Also, these are really popular for Movember. 25mm button badge hand made in the UK.